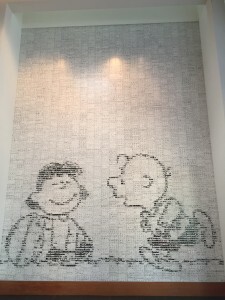 A huge mosaic made up of individual Peanuts comic strip panels. 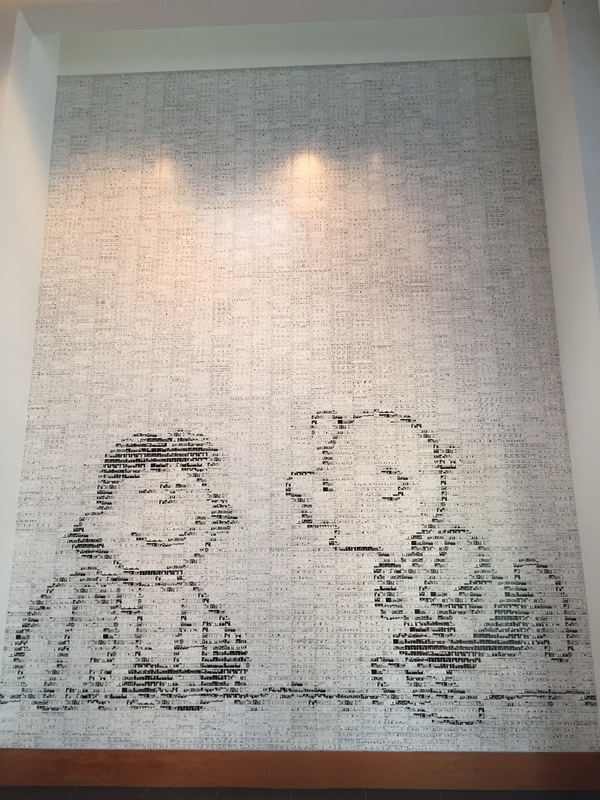 This week I had the pleasure of visiting the Charles Schulz Museum in Santa Rosa. It’s a must viit for any Peanuts fan, but it’s also a great visit for anyone interested in exploring a unique view on creativity, storytelling, and the art form of the comic strip. There are also a great number of lessons available to learning and performance professionals throughout the museum. 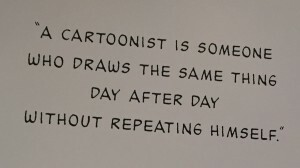 One of my favorite aspects of the museum are the quotes from Schulz that decorated the exhibit space, many of which resonated to me in the work that we do. Draw from your own personality and your own experience. Schulz drew heavily from his own life and personality on his Peanuts stories. The characters were all based on people he knew, which helped them be more fully developed. He also incorporated much of his personal experiences into the strip over the decades he drew it. By incorporating his personality and experiences into the strip, Peanuts developed it’s own unique personality as a comic strip. How much of yourself do you incorporate into your projects? In a high-speed, template-driven world, personality is often lost in our work resulting in sterile projects that often look and feel exactly the same from project to project. Prioritizing the addition of personality in your work can make it enormously more engaging to those interacting with your project. It’s extremely important for a cartoonist to be a person of observation. There is inspiration all around us, be it for the next comic strip, or the next elearning project. There are countless ideas to inspire our design and creativity in our daily lives; we just have to be observant enough to see them, and more importantly, see the links to how the inspiration can be applied to our work. 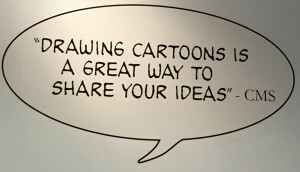 Drawing cartoons is a great way to share your ideas. I’m no artist, but I do try to practice my drawing skills as often as I can. This quote is part of the reason I do. There are many times I have found myself stuck in trying to explain something to someone in words, only to find it was much easier and quicker to make the idea be understood by sketching something out. Drawing – be it a cartoon, a storyboard, or a simple sketch – can be a very powerful tool to help make yourself understood. In cartooning the first thing to develop is patience. Writing a daily comic strip for decades must be exhausting. While there is rigor in the drawing itself, I would suspect the bigger contributor to exhaustion is coming up with new storylines every day. I’m sure like many of us, cartoonists have days that the creativity just isn’t flowing as well as would be desired. It could be easy to get frustrated and walk away, but sometimes you need to be patient with yourself and allow yourself the opportunity to break through the barrier holding you back, and more importantly, recognize that the occasional block is a natural part of the creative process. 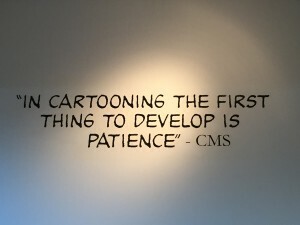 For cartoonists the patience metaphor likely extends to the business side of cartooning, working with publishers and producers that prioritize the monetization of the art more than the art itself. These frustrations apply to designers of learning programs as well. A cartoonist is someone who draws the same thing day after day without repeating himself. I think this was my favorite quote in the museum. Charles Schulz drew a new peanuts comic every day. Most days consisted of a standard 4 panel comic, with an expanded layout on Sundays. And he kept audiences captivated for nearly fifty years. Possibly more impressive, he kept himself engaged in his work for the same half-century. Let’s put this impressive feat another way. This man had a template – the four panel comic strip – and found a way to create content within the template that made you laugh, cry, and most importantly, think. By adding a piece of himself into his work, and by incorporating what he observed in daily life into his stories, by sharing his ideas through the visual art of the comic strip, and by most of all being patient with the rigor attached to the requirements of a daily comic strip, Charles Schulz managed to keep things fresh for audiences across multiple generations. As learning professionals, we’d do well to incorporate a little more “Schulz” in the projects we build to help people learn and build their skill sets.